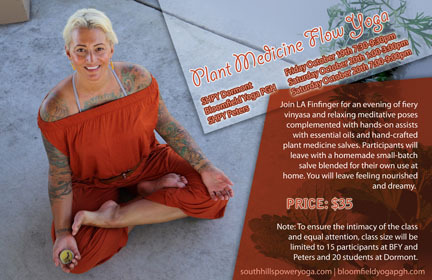 Join LA Finfinger for an evening of fiery vinyasa and relaxing meditative poses complemented by hands-on assists with essential oils and hand-crafted plant medicine salves. Participants will go home with a small-batch salve blended for their own use. You will leave feeling nourished and dreamy. Note: To ensure the intimacy of the class and equal attention, class size will be limited to 15 participants at Peters and 20 students at Dormont.